From the labelling machine to the semi-automatic filling machine and to the fully automated e-liquid packaging line, CDA allows each company to control its production of eliquid and to maintain the desired speeds. Becoming an alternative with less harmful effects than original cigarettes, the electronic cigarette and thus e-liquids are becoming the most serious substitute for quitting smoking. Depending on the size of the company and the desired packaging capacity of e-liquid vials, the needs are various. 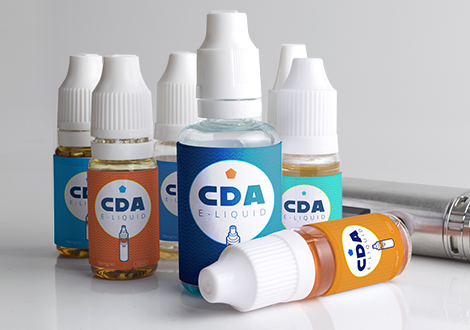 In 6 years CDA has become one of the leaders in the e-liquid sector by offering a complete range especially dedicated to e-liquid: automatic labelling machines, semi-automatic filling machines and monoblocks. Automatic labelling machine with two labelling stations that can label up to 50 bottles of e-liquid per minute or automatic labelling machine with a single labelling station that can label up to 60 products per minute, CDA has developed machines adapted to all liquid formats for electronic cigarettes: 10 ml, 50 ml, 100 ml and up to 1 litre bottles. The filling of e-liquid bottles requires high precision. The K-ONE semi-automatic peristaltic filling pump designed by CDA offers one of the best filling accuracy on the market with an error margin of +/- 1%. Its fast rate allows the filling of up to 1500 vials in 10 ml per hour. CDA’s range of E-FILL e-liquid packaging monoblocks is the best on the market. Our “all-in-one” packaging lines allow all packaging operations to be carried out on a single machine: automatic filling machine, automatic screw-capping and automatic labelling machine. Depending on the options, our E-FILL S automates all the operations: bottle straightening, capping,, filling and labelling. Depending on the models, the production rates vary from 25 to 50 products per minute. Automatic unscrambler for e-liquid bottles, automatic hopper, feeding/receiving table for all types of e-liquid bottles, CDA has developed a whole range of complementary solutions to optimize the packaging of your juices. Manufacturer of labelling machines, filling machines and complete lines since 1991, CDA has bet on the “BOOM” of the electronic cigarette by designing solutions specially adapted to the packaging of e-liquid bottles. In 5 years, our R&D investment, our mastery of TPD standards and our customer focus have made CDA the world leader in the sector with more than 300 machines designed, manufactured in France and sold worldwide. CDA has been able to manufacture filling machines that meet the specific constraints of e-liquid by offering solutions using a peristaltic pump that facilitates the change of liquid in order to fill various flavours (change in less than two minutes without cleaning the pump). In a sector that is constantly changing and thanks to our experience, we have focused on designing solutions to meet the needs of each market player, from the very small companies to the largest group. From the automatic labeller to the complete packaging line, our machines are in line with the companies and their future development. Beyond the importance of the production rate and speed of the e-liquid production, the bottle sizes are also taken into account: 10 ml, 30 ml, 60 ml, 120 ml, 200 ml. These different products need to be packaged on the same machine, this is why we have developed flexible machines. The VSEs will be equipped with semi-automatic machines. A semi-automatic filler and a semi-automatic labeller will initially be the most accurate way to star a business. SMEs will move towards more automatic packaging machines with higher packaging rates than semi-automatic labellers and fillers for e-liquid products.